Alyssa Graves winds up for a pitch. Graves and the Bulldogs defeated Ball State and UIC in consecutive days. Jimmy Lafakis/Collegian file photo. 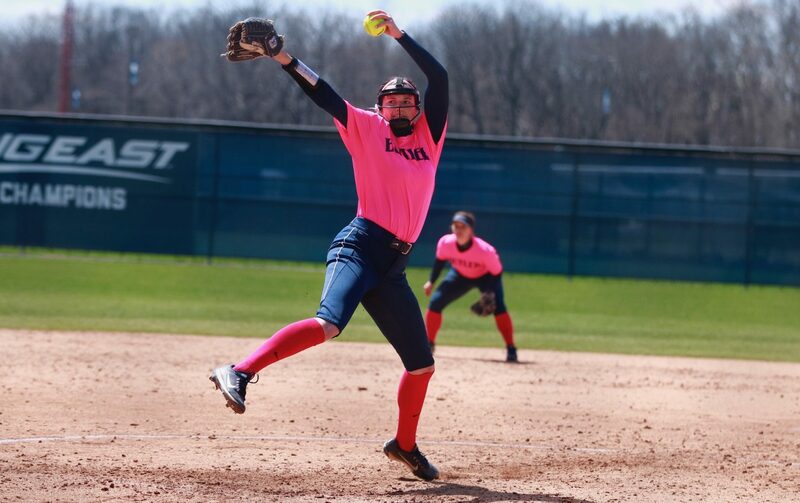 In a break from Big East action, the Butler University softball team picked up victories over Ball State University at home and the University of Illinois at Chicago on the road on April 18 and 19. After defeating the Cardinals 9-3 and the Flames 7-3, the Bulldogs are 17-21 on the season, and remain 5-4 in conference play. Against Ball State, the Bulldogs struck early with two runs in the first inning and six in the second. In the first inning, junior pitcher/infielder Kaitlin Doud drove in a run with a single to start the scoring, and senior outfielder Sarah Dixon plated another run with a sacrifice fly. In the second inning, sophomore infielder Christina Candotti started the scoring with a solo home run, her first of the season. Then senior infielder Alyssa Lach contributed an RBI single, Doud drove in a run with a groundout, and Dixon plated a run with a double. Junior catcher Sammy Andersen capped off the inning with a two-run single that scored Dixon and sophomore infielder Madi Christiansen. Butler tacked on another run in the fifth inning on a solo home run by freshman Claire Gilliland, her first of the season. The Bulldogs’ pitchers limited the Cardinals to just five hits in the contest. Freshman Alyssa Graves made the start, pitching 4 ⅔ innings while surrendering two earned runs on three hits, six walks, and seven strikeouts. Doud came on in relief, giving up one earned run over the final 2 ⅓ frames to secure the victory. Doud, Dixon, and Andersen all finished the game with two RBI, while Lach and Gilliland each collected two hits. Against UIC, Butler struck first again with an RBI single by Dixon in the first inning. The Bulldogs scored again on an error in the second inning before the Flames tied the game up at two in the third. A bases-loaded walk by Christiansen helped Butler reclaim the lead with a run in the fourth inning. Butler then added a run in the sixth inning and three in a seventh inning which included home runs by Dixon and Gilliland. UIC plated a run in the bottom of the seventh inning, but Butler was able to hold on for the 7-3 victory. Doud pitched a complete game for Butler, surrendering two earned runs on 11 hits, one walk, and one strikeout over seven frames. The Bulldogs will now return home for a three-game weekend series against Providence College, beginning with a doubleheader on Saturday, April 21.